The Humanscale CPU600 Holder is an innovative accessory. Its main function is to carry your CPU securely under your desk. This function will stop it from being on the floor, therefore, this will prevent it from getting in the way of your feet or getting dirty and damaged. It is manufactured using 51% recycled content in weight and overall the CPU600 is 99% recyclable. You can either get your Humanscale CPU600 in sturdy steel or aluminium, so rest assured that it is completely durable and secure for all users. Furthermore, due to the design of this incredible accessory, your PC will actually stay cooler whilst it's being upheld in the CPU600. The accessory has a tool-free installation making the accessibility for ports and drives simple and quick. The 360 swivel technology allows you to easily turn your device around and adjust cables, offering a simple and efficient solution to setting up, repairing and upgrading your PC. 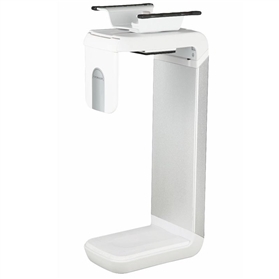 We know that from the pictures you may be concerned that your device will fall out of the Humanscale CPU600 Holder. Don't be alarmed - the CPU600 is installed with a mounting plate, meaning there is complete control and security for your PC at all times. 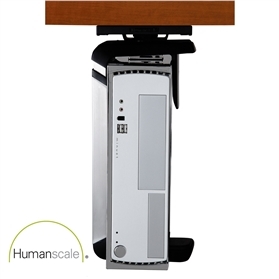 Want to talk to someone about where you can find the best Humanscale CPU600 Holder for you? Please contact us or call 0845 600 1917.